Both Mindy and I were extremely impressed with the ceremony. Our guests commented our how nice a smooth everything seemed to flow. Thank you again Garry, you helped make our day unforgettable! Sincere thanks for keeping it real, we had such a positive experience getting married- who knew it could be so much fun!?! Garry you absolutely rocked – your service was exactly what we wanted for our wedding and set the tone for the rest of the night: surprising, fun, a bit irreverent and a big fat celebration of how much we love each other’s guts! Thanks a million from the bottom of our hearts. Garry, thank you for making our day so special. Makiko and I and all of our guests had such a great time. It was so much fun.Thank you for your help and being sensitive to our needs and making the process so easy.It is a day we wont forget. Thank you so much for your splendour on Sunday Garry/Elvis.You were absolutely wonderful, and the whole thing was hilarious and romantic and a lot of fun – thank you! We had an absolute ball. So many people have said it was the best wedding they had ever attended. We had such a great time, people are still talking about our ceremony and raving about it ! I loved that you kept all the Elvis lyric vows a secret, I was laughing my head off- loved it! It, far exceeded my expectations. So you can’t do much better than that. It was exactly what we needed. Fun, funny and relaxed. Thanks Garry !! 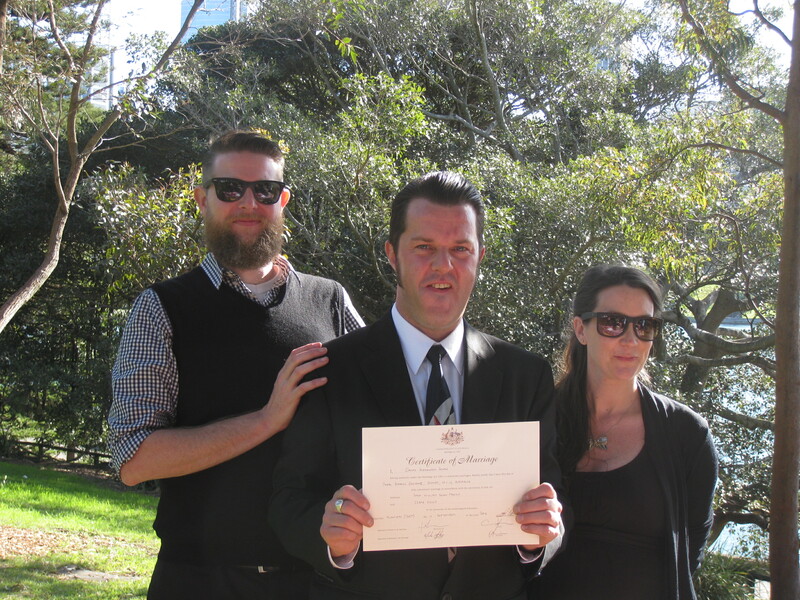 Garry made the whole “getting hitched” process a breeze. From our first contact he helped and guided us though everything, taking the time to explain each step and making it as stress free and easy as possible. Garry’s highly personalised service perfectly captured what we wanted for our day, an intimate, low key affair with joy and laughter to celebrate our union. We cannot thank Garry enough for all his help and for making the day such a pleasure. We would definitely recommend Garry to anyone looking for a celebrant who can ensure a relaxed, fun, and positive start to married life. And we didn’t even go the Elvis Option! Thanks G7, you are one hunka hunka burning love matcher!